Join The Mood U Team & special guest NYC based fashion designer SEAN KELLY, winner of Project Runway and Project Runway All Stars Finalist as he guides you through this fun workshop! Sean will be showing you all the tricks you need to know to work with luxe European fringe and applying it to your very own tote bag! This 3hr workshop is the most fun you can have on a visit to Mood Fabrics NYC and even better you get to meet one of your favorite designers from Project Runway. *Please note, some equipment listed is for use in-store only and not for participants to keep. All of these items are to be handed back at the end of the workshop. You will need fabric for your project and FRINGE! Lots of FRINGE!!!! 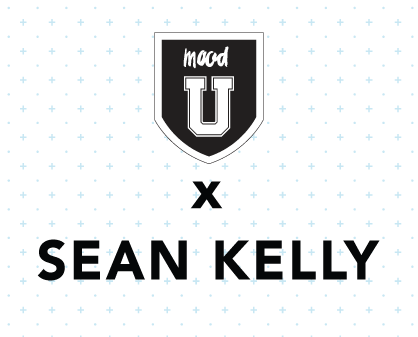 You will be guided by Sean Kelly and the Mood U Team on these in-store purchases. Please wait for the first part of the workshop for guidance, shopping tips will be given in the first 15 minutes of workshop. Please email us at info@moodu.com if you have any specific questions about this event that are not answered below. This is an all-inclusive event and we suggest ages 9+. If your younger ones want to join we suggest they are accompanied by a parent or guardian. You must arrive on time to purchase tickets at the door. The event may be sold out and we can not guarantee entry for walk-ins if that is the case. Please see above. You will also receive detailed information in your email confirmation after you purchase your ticket. All large bags must be checked in with security at the front entrance on the Third Floor. Anything to be carried in to the class room must be in a clear vinyl bag. No, we have sewing machines at this event for you to use. Tickets are non-refundable and non-transferable. Mood Fabrics has a no returns & no exchange policy on items purchased in store. Can I switch my ticket to another event time in future weeks? We ask you to choose a time that works best with your schedule. Transfer to other event times is not available under any circumstances. All tickets are non-refundable and non-transferrable.